Need Extra Space Or Shelter For Customers Or Staff? From restaurants and cafes wanting extra sheltered seating outside, to clubs wanting an area for smokers, or simply more usable space, Fresco Shades has a range of commercial awnings and canopies options to suit. Canopies can be free standing or attached, and with the addition of side curtains, it’s possible to create a dry, sheltered spot that can be used all year round. There are many possibilities when it comes to enclosing the area – ranging from spring loaded curtains, to roller sides, even permanent sides… we can also include louvers for ventilation on windy days. We have a wide range of fabrics available (over 15 colours), but most people prefer the white or off white shades. The metal frame can match your building paint or contrast, depending on your preference. Many companies use our commercial awnings to provide a covered area for staff to sit outside during their breaks. These have been especially popular as smoking areas. Provide shelter and a focus to your entrance area. We can design a canopy that suits the area. Protect company and staff vehicles from the sun and rain with a canopy or one of our specialized shade structures. Running out of space? Why not use a commercial canopy to create more. Canopies have been used for undercover storage areas, container load/unload areas, outdoor workshops etc. They can be freestanding or attached to the side of a building. High quality architectural grade PVC roofing, blocks heat while letting in plenty of light. Own a cafe or restaurant? Fresco has been covering outdoor dining areas for over 20 years. Let us help your transform your outdoor dining area into an outdoor room that can be used year round, regardless of the weather! 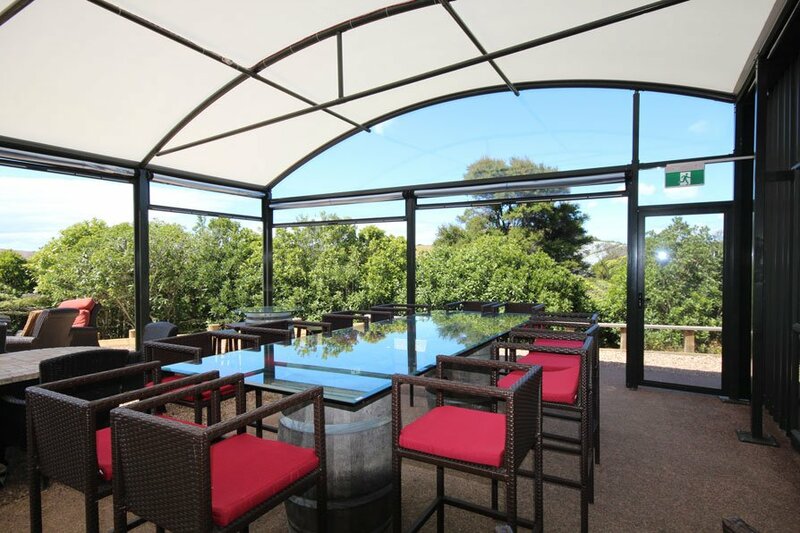 ”Having this extended capability has increased the popularity of the restaurant overall, and made it a lot easier to keep out patrons comfortable, especially in windy conditions. It has also allowed us to go after opportunities that were out of our reach before, as we can now guarantee weatherproof seating conditions for much larger groups. One of our sales reps will visit your workplace for a free, no obligation quote.Our reps will look at your situation, measure the space and advise how best to proceed. They will show you some fabric samples and steel colours, and discuss side screen options. Within a few days we will come back to you with a quote.